Since the attack on a popular gay nightclub in Orlando left 49 people dead earlier this month, pride celebrations across the country have taken on a new meeting. They've become platforms not just for celebration, but also for remembrance. On Sunday, a photo from New York City's pride parade showed just how the Orlando shooting impacted the annual celebration — in perhaps the most uplifting way imaginable. 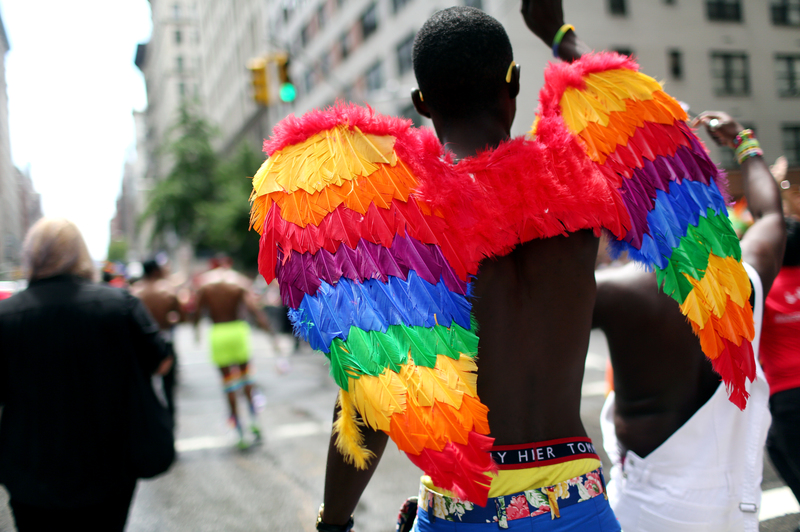 As the annual pride parade wound through Manhattan on Sunday afternoon, tens of thousands of people marched along Fifth Avenue and millions of others observed from the sidewalks. It was a hot, summer day in the city, but one group of young attendees had the perfect refreshments. According to The New York Times, three young boys set up a lemonade stand near Fifth Avenue and East 111th Street to raise money for an organization helping the victims of the Orlando shooting. The lemonade stand, aptly called "3 Boys Lemonade," was manned by Finn Madden, Dean Haines, and Sean Bernstein, who are three and four years old. They charged $1 per cup of lemonade, but they seemed to be raking in much more than the asking price. Madden, 4, told the Times that he had received a $20 tip from one customer. Meanwhile, Madden's mother told the Times about the young businessmen's motivation for the lemonade stand. "When I told Finn about the parade, maybe it’s because they’re so young, he said, ‘Well of course people should be able to marry whomever they want," she said. The boys also had a tray of cookies to offer. Sticking with the pride theme, one wore a rainbow lei, and the table was topped with a rainbow tip jar. The young trio wasn't the only group to make a connection between Sunday's pride parade and the recent tragedy in Orlando. The parade began with an announcement from New York Gov. Andrew Cuomo and a moment of silence. In his address, Cuomo announced that the state would honor the 49 victims of the Orlando shooting with a monument. In the parade itself, many groups honored the Orlando shooting victims. A group of silent marchers wore white and displayed photos of the 49 victims who were killed. Other groups chanted their support for gun control legislation in the wake of the shooting and the ongoing debate in Congress over guns. All in all, it was a celebratory affair that struck a balance between festivity and remembrance.